Neewer 600W Battery Powered Outdoor Studio Flash Strobe Lighting Kit:(2)VISION4 Monolight with 2.4G System, (2)Translucent White Umbrella, (2)Rectangular Softbox for Video Shooting Location Photography. Camera ans Light Stand are not included. Note: This item comes with a UK mains adapter permanently fixed to the power cord. The mains adapter is fused and complies with BS 1363 regulations. Guide Number: GN60(2m, ISO 100). Power Output Range: 6 f-stop range (1/1,1/2,1/4,1/8,1/16,1/32,1/64). Full Power Flashes: 700 shots. Successive Flashes: 3 shots;5 shots;7 shots;10 shots;12 shots;15 shots. 2.4G Wireless: 16 Channels (1-16);4 Groups (A, B, C, D). Modeling Lamp: LED 13W, 1370 Lumen(Energy Saving). Flash Tube: "Plug-in" tube (user replaceable). Flash Light Dimension: 125mm(diameter) x 220mm(length). Flash Light Weight: 1.8 kilograms. Charging Voltage(UK): AC 220-240V, DC 12V. Flash Light Protection Function: Overheat protection; Low voltage automatic power cut-off system. Effective Trigger Distance: Around 15m. Power Supply: CR2 3V Battery(Included). Size: 23.6" x 35.4"/60cm x 90cm. 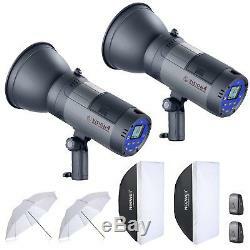 It broadens and diffuses the light output of any tungsten or studio flash source. Material: Nylon Material, Aluminum shaft. 2 x Vision4 Studio Flash. 2 x Lithium Battery (Included in the flash). 2 x LED modeling Lamp (Included in the flash). 2 x 220-240V AC Charger. 2 x 4-meter 3.5mm Sync Cord. 2 x Wireless Trigger(Battery Included). KIT INCLUDES: (2)VISION4 Studio Flash(Li-ion Battery Included), (2)Wireless Trigger, (2)Rectangular Softbox, (2)Translucent White Umbrella; This flash kit is perfect for convenient battery cordless location shooting. VISION4 STUDIO FLASH: High GN60, German Engineered 300W flash includes a wireless trigger; Built-in 2.4G Receiver with 8 Channels; Extremely short flash duration: from 1/1000 to 1/10000 seconds. 6 steps of power adjustment(1/64 to 1/1); Large capacity lithium battery pack to provide 700 Full Power flashes and fast recycle time(0.01-2.5 seconds). RECTANGULAR SOFTBOX: Removable internal and external diffusers for versatility in refining the hard and soft ratio of flash light; Standard size Bowens speed mounts, fits for the 300w 400W 600w 800W 1000w studio flash. TRANSLUCENT WHITE UMBRELLA: Can be used either as a shoot through or bounce light to reduce shadows and produce an even, soft, low contrast light over a relatively large area. PERFECT STROBE LIGHTING KIT: Such a strobe lighting kit can help you achieve much more perfect effect when you are shooting, brings you more conveniences and amazing shooting experiences. This item is 100% Brand New. We will reply you with 24 hours. Please leave us 5 star feedback. We could resolve the problem, because we believe everything could be resolved through communication, THANK YOU! The item "Neewer 600W Vision4 Studio Flash Strobe Lighting Kit with Umbrella and Softbox" is in sale since Thursday, January 17, 2019. This item is in the category "Cameras & Photography\Lighting & Studio\Flash Lighting\Monolight Flashes". The seller is "miketech-1" and is located in Swansea, Wales. This item can be shipped to United Kingdom.